Simply stated, “We Print It and You process It”. The world of business printing is the documents used to run your business. These are the documents that we print and you add information to them to communicate with your clients and prospects. Designing and supplying business forms and documents is where we started over 30 years ago. BRIDGE® has always taken a systems approach to our designs and products. That means asking questions and listening to what our clients’ needs are to graphically communicate important information. It could be an invoice that tells someone how much money they owe you, or a check that pays an important vendor partner. It could be letterheads, envelopes and labels to be “completed” with your message. 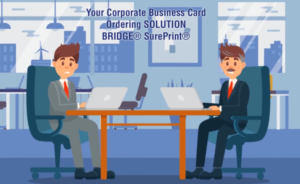 Business Printing is about clearly communicating with your public, maintaining your brand and having documents that help you run your business efficiently. We are here to listen and help you best communicate your message. Every business needs that extra bit of branding to stick out when delivering papers with valuable information on it. If you aren’t brand labeling your purchase orders and invoices, your company is missing valuable branding space. We offer one to six color labels as well as 4-Color Process Labels; all shapes and sizes; custom, stock and special adhesive applications. Singles, rolls, continuous and cut sheet.